I've probably been following Caleb's career for a long time, I can honestly even remember the first time I heard him while I was looking for Full Metal Alchemist covers and I ended up becoming a full fledged fan with his rendition of Defying Gravity. 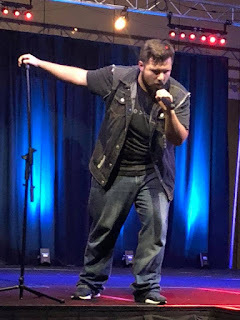 Albeit his biggest assets besides his incredible voice are his charisma and that his authentic, what you see on-screen within his music videos or his streaming's at his Twitch account is him, an incredible genuine guy who can make anyone feel welcome. Last year on 2017 I had the chance to see him for the first time along with Jonathan Young at Metro Con, I missed the concert but I made it on time to check their Disney Sing-A-Long, it was fun, and it was also my first time going to a con, I couldn't honestly believe they were there. They sounded as they were in the music videos, people in the sing-a-long room where going euphoric, they were excited to interact with their idols and be in the same stage as them but they were happy to see them live; a year later, I had the chance not only to be back on Metro Con but to see the concert of 2017 and it was awesome, the fans were happy singing along and repertoire was incredible. Myself and my friend Kim who was the one who introduced me to the world of the cons we sat down outside the auditorium, I was happy just to have a chance to see them in person, when my friend saw they were leaving the auditorium surrounded by fans she was excited too as it was myself who passed their music to them, she knowing I am a fan of Caleb Hyles said to me you should go before you lose your chance, I only replied "there is always a next year, but I am happy just by the chance to see him and Jon live"
After the fans were asking for photos and autographs, an improvised session happened just in front of us and they were there near room 23, they ask if it was OK for me and my friend if they could the session there, they even ask the Metro staff and they didn't objected. My friend again ask if if I was going to say hello but the nerves collided and I was there watching but being happy. A year later, or summer 2018 I went back to Metro Con, after seeing that he and Jon were invited I bought the ticket as soon as possible and as always when it reached July me and my friend we went again, we even made a tradition to go as many cons even for one day but Metro Con has become the it event for events, cosplayers and music. The first day I was excited, we saw each other and we spend a good chunk of the day listening to music and going to a few panels. Yes, on the comic cons you have people outside any events playing music on the hallways of the con, again at a certain time around 3PM on Thursday we saw them, Caleb's wife was there too and RichaadEB who got invited was along with Thunderesque, I panic one more time and it was something that never happened to me before as I am usually not a nervous person but there was a group of people I deeply admire in real life. On Saturday after shopping some items and I didn't wanted to hang out on them I took them to the car, on the way I inbox Caleb as I wanted to say hello before the concert started, in the mean time I was also getting messages from a friend who was also going and they were going to the concert and they were waiting for Caleb also, he was going to let them in, when I was heading to the second floor in between the communication, I got another message from Caleb that he was heading to Kelsan but he was also on the second floor. I never imagined meeting someone I admire as much under those exact circumstances, chasing each other and chasing another person. I saw him by mere casualty before taking the electric stairs for the first floor, out of nowhere I let my voice create the most loudest but bass tone I could generate and in between the noise he heard me, there was this big smile in both of our faces and there was an honest hug as if we knew each other in real life as long as memories could take us. The last day I had the chance to get a few merchandise items getting signed, in between those items those items there is one of the CD's with covers, the cover itself is extremely kawaii and it follows that style of Japanese form of animation that the characters are bishonen in which the characteristics are made to be as cute as possible. The album is a series of covers to Anohana, Naruto, Yuri on Ice and One Punch Man, which make the album have a great feel good vibes, in which you can enjoy on a quiet afternoon. 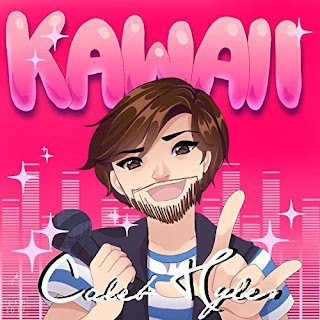 Much of the songs can be found also on Caleb's channel for free, the only exception but I am not even sure is the Unravel - piano version as I never heard that one before on his channel. The essence of the album is just pure and wonderful, it's enjoyable as it has happy tunes around, it really uplift the spirits of anyone; but, also it's a reflection on how music that is aimed for nerds can reach to anyone; in 20 years I wouldn't imagined people singing along to anime intro's and lesser gathering to celebrate nerd culture. Kawaii is a testament on how one person can gather so many people through music, make them feel they are friends for a long time but also to let anyone find friends within his community of #peaceloveandmetal. Kawaii is one big celebration to the conventions where people can gather and be their authentic selves; Kawaii is a celebration to friendship.